Prity melons are medium-sized and very round, measuring up to 15 centimeters in diameter. They have a smooth, thin yellow rind with a speckled green overlay. The pale green flesh is firm and juicy with a crisp texture. It offers a refreshing, sweet flavor with a hint of sourness. Prity melons are available in the summer months. Prity melons are a new variety of sweet melon, with a twist. Botanically they are classified as Cucumis melo and are a part of the inodorous group, known for their lack of aroma. They are considered a “sweet and sour” variety for the sweet, tangy taste of the flesh. Prity melons are new to the United States market and were not available before 2018. Prity melons are an excellent source of vitamin C and a good source of potassium, iron, folate and dietary fiber. They are a source of essential B-complex vitamins, vitamin K, and the minerals magnesium, calcium, copper, manganese, and selenium. The honeydew melon hybrid also contains choline, phosphorus, and omega-3 and omega-6 fatty acids. Prity melons are most often used raw and chilled. Wash the melons, to ensure no dirt or residue remains on the rind. Halve, scoop the seeds out of the center and slice the fruits. The thin skin can be peeled or removed with a sharp knife. Cut melon can be added to fruit salads, displays or cheese platters. Add the sweet and sour melon to green salads, or chill and mix with mint and ginger for a refreshing summer salad. Juice for beverages, frozen desserts, or cocktails. Prity melons need to be stored in the refrigerator and will keep for up to 5 days. The seed company that developed the Prity melons is well-known for their award-winning melon hybrids. Five different named varieties have gone on to be recognized as international All America Selections (AAS) Winners. Prity melons were first registered as a new product in Taiwan in 2012 and are a protected variety. The seeds are distributed by the American arm of the Known-You Seed Company. Prity melons are in the casabas group, which are widely grown throughout Central Asia and in areas west to Turkey and the Mediterranean. 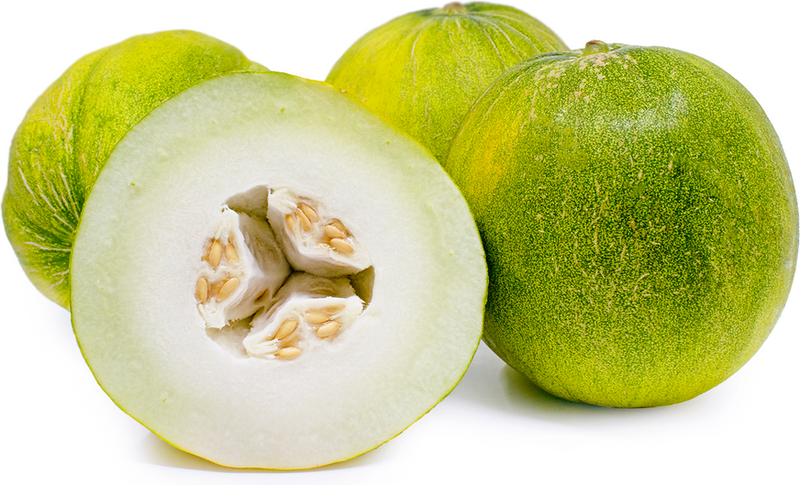 They are considered the sweetest of all the melon varieties and tend to have longer shelf lives. As of summer 2018, they can be found at farmer's markets in Southern California.